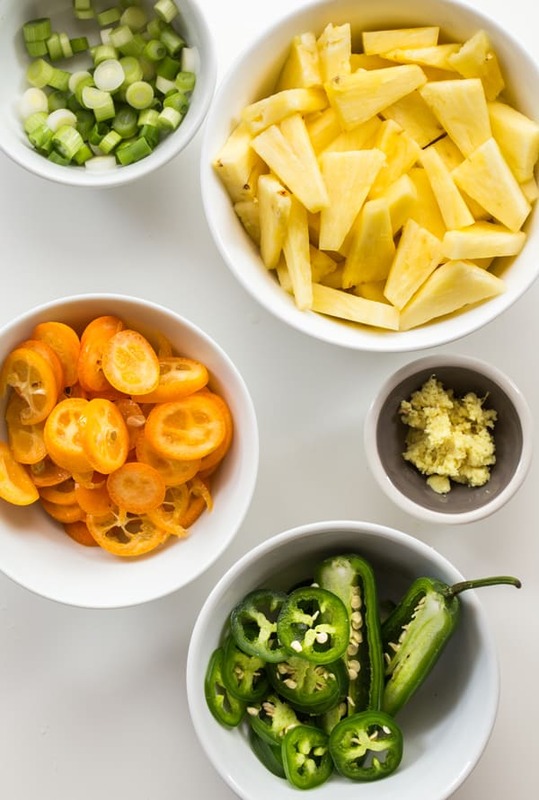 Pineapple and tofu are two of my favorite ingredients for a stir-fry, but this particular recipe has a sleeper ingredient you might not think of using: kumquats! The kumquats are optional in this recipe since their season is so short, but if you can find them, I implore you to use them. After many years of admiring kumquats at the grocery store, I finally decided to buy some. But then I didn’t know what to do with them! I thought they’d be nice candied or turned into some kind of jam, but I’m not in a season of life where candying and jamming are possibilities. Feeling desperate, I sliced them up and added them to a stir-fry. Because I had to use them somehow! Well, guess what? Stir-frying kumquats works. The citrus flavor adds a little bit of complexity to the sauce, and the kumquats themselves get perfectly caramelized from the high heat of the stir-fry, which tames some of the tartness. The peel is edible and it softens further after being cooked. 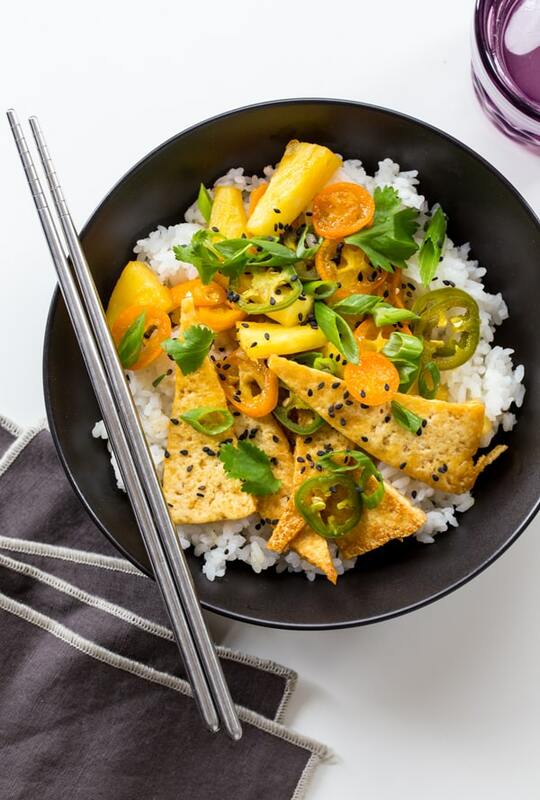 After making this discovery, I started adding kumquats and mandarinquats to our weekly stir-fry dinners; this particular recipe, loosely adapted from a Stir-Fried Pork and Pineapple recipe from The New York Times, is my favorite. A sweet-and-savory stir-fry, inspired by The New York Times’ Stir-Fried Pork and Pineapple. Whisk together the sauce ingredients in a small bowl. Set aside. Cut the tofu into 8 slices. Cut each slice into 2 rectangles, then cut each rectangle into 2 triangles, for a total of 32. Line a large plate with a paper towel. Heat 1 tablespoon of oil in a large skillet or wok over medium-high heat. Add the tofu and cook on both sides until lightly browned and crisp, about 5 minutes per side. Remove the tofu from the skillet and transfer it to the paper towel-lined plate to soak up any excess oil. Sprinkle with salt. Return the skillet to medium-high heat and add the remaining tablespoon of oil. Have all of the stir-fry ingredients at your side, ready to go. Add the white parts of the onion and the ginger to the skillet and cook, stirring constantly, 1-2 minutes, or until the onion starts to soften. Quickly whisk the sauce again and pour it into the skillet, along with the pineapple, pepper, and kumquats (if using). Cook for about 2 minutes more, or until the sauce has thickened slightly. Stir in the tofu and remove from heat. Divide the stir-fry onto 4 plates or bowls with your grain of choice. Garnish with the reserved green onions and roasted cashews, cilantro, and/or sesame seeds. Prep time includes inactive time pressing tofu. I’ve never thought of stir-frying kumquats, but that is genius!